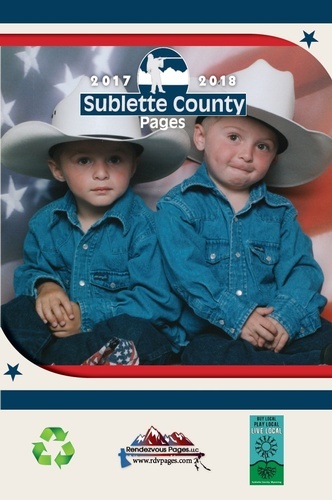 Pick up a free copy of the Sublette County Pages at the Sublette County Chamber of Commerce and Visitor Center. 1) Focus on the client and the rest will follow. Our ultimate goal is to serve you, rather than our own internal goal or bottom line. 2) It’s best to do one thing really, really well. We know the yellow page industry, and sport some of the most talented and ethical sales reps in the business. We know what we do well, and we are in the business of recreating it. 3) Great just isn’t good enough. We are dedicated to constantly improving our products, and doing research to make sure our clients are always getting the best. It’s all about the product, product, product. 4) Our goal at Rendezvous pages is to create the best product possible. When you go to the Cadillac dealership you don’t want to drive away in a Volkswagen, for the same cost. We are in the business of selling Cadillacs. Our products speak for themselves, easy to use, accurate, and classy. bottom line. Our clients trust objective and no short-term gain could ever justify breaching that trust.